In 1636, thirty families were settled in Pyaug, a tract of land belonging to Wethersfield on the eastern bank of the Connecticut River, bought from the Native American chief Sowheag for 12 yards (11 m) of trading cloth. In 1672, Wethersfield and Hartford were granted permission by the General Court to extend the boundary line of Pyaug 5 miles (8 km) to the east. By 1690, residents of Pyaug had gained permission from Wethersfield to become a separate town and, in 1693, the town of Glassenbury was created. The ties have not been completely broken: the oldest continuously operating ferry in the United States still runs between South Glastonbury and Rocky Hill, also then part of Wethersfield, as it did as far back as 1655. 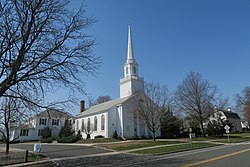 One result of being split off from Wethersfield was that the town was built along a main road, rather than around the large green that anchors most New England towns. After part of New London Turnpike was realigned to eliminate the rotary in the middle of town during the mid-20th century, a small green was established there. During the American Revolutionary War, several homes were used to hold classes from Yale University. Noah Webster was a student in these classes; later he taught at one of Glastonbury's one-room schoolhouses. Glastonbury freed its slaves in the 1780s, sixty years before Connecticut formally abolished slavery. The town organized its first library in 1803. It organized the first hospital shortly after the Revolution to combat and treat smallpox. By the end of the Revolution, there were ten schools, formed one by one during the 18th century. During the American Revolution, George Stocking's gunpowder factory operated in the town. In 1785 the town residents renamed Glassenbury to Glastenbury. In the 18th and early 19th centuries, Glastenbury was a shipbuilding town. Located on the Connecticut River, it had reliable waterpower and nearby hardwood forests of oak. Sawmills, charcoal kilns, and foundries developed around the shipyards to process timber and other goods for their needs. As shipbuilding was ending, the early industrial beginning continued. The J.B. Williams Soap Factory started in 1840 in James B. Williams' drugstore in Manchester, where he experimented with chemical formulas for shaving soap. When he had produced a formula that satisfied him, he moved his business to Glastonbury. Two years later, he was joined by his brother, William Stuart Williams. They formed what is believed to be the first commercial soap manufacturing business in the world. Although shaving soap was their first product, they also made ink and shoe blacking. Products made by the J.B. Williams Company included Williams 'Lectric Shave and Aqua Velva. Over time, J.B. Williams expanded to Montreal (around 1922), England, and Argentina. When the business was sold in 1957, ten former employees organized Glastonbury Toiletries and continued operation into the 1970s. J. B. Williams Park, on Neipsic Road, is named for James B. Williams. Remaining parts of the industrial complex have been adapted for use as the Soap Factory Condominiums. Another portion was occupied by the Glastonbury Board of Education office and is now occupied by a translation company. In 1870 the name of the town was changed from Glastenbury to Glastonbury, with a spelling to match Glastonbury, England. During the World Wars, Glastonbury factories supplied leather and woolen goods to the military of Belgium, France, Great Britain, Italy, and the United States. In addition, Glastonbury has been a center for feldspar mills, cotton mills, paper mills, and silver plate factories. It also had an airplane building industry. J.H. Hale Orchards began operations in 1866 in Glastonbury. John Howard Hale became known as the Peach King for developing a peach that could withstand New England winters and was disease resistant, as well as for the large, national scale of his operations. He also had land in Georgia and was the first Glastonbury industry to establish a branch outside the state. A marketing pioneer, Hale shipped peaches to markets all over the country. The orchard that started with 1-acre (4,000 m2) in 1866 grew to more than 1,200 acres (5 km2) by 1900. John Hale never went beyond grade school, but he initiated the founding of Storrs Agricultural College, now the University of Connecticut. He helped to organize the Glastonbury Grange and the State Grange. His home, at the intersection of Main Street and Route 17, has been adapted in the 20th century for use first as a restaurant and, more recently, for business offices. Henry Saglio began a pioneering effort to breed a white chicken, because black pinfeathers were difficult to pluck from a bird headed for the dinner table. In 1948, the Saglio Brothers formed Arbor Acres and produced a broiler chicken that A&P Food Stores awarded the title "Chicken of Tomorrow". By 1958 Arbor Acres was selling globally. Today the brand is owned by Aviagen. In 1977, Henry Saglio was inducted into the Poultry Hall of Fame. Glastonbury was also a major grower of broad leaf tobacco. This agricultural tradition is carried on by the orchards and berry farms on its hills. Part of Glastonbury resides in an area called "Kongscut Mountain", locally called "Rattlesnake Mountain", because it has a small population of timber rattlesnakes. Since that area is sparsely developed and mostly in a state forest, the snakes don't pose much of a threat. The town boasts a small private lake named Diamond Lake, which is surrounded by growing subdivisions of large homes. Access to the lake is limited to members of the Diamond Lake Property Owners Association. Glastonbury has one of the largest state forests, Meshomasic State Forest, a popular area for hiking, fishing, and hunting. Glastonbury borders the town and cities of East Hartford, Wethersfield, Rocky Hill, Cromwell, Portland, East Hampton, Marlborough, Hebron, Bolton, and Manchester. As of the census of 2000, the racial makeup of the town was 93.10% White, 1.53% African American, 0.15% Native American, 3.40% Asian, 0.01% Pacific Islander, 0.91% from other races, and 0.89% from two or more races. Hispanic or Latino of any race were 2.51% of the population. There were 31,876 people, 12,257 households, and 8,984 families residing in the town. The population density was 620.5 people per square mile (239.6/km²). There were 12,614 housing units at an average density of 245.5 per square mile (94.8/km²). There were 12,257 households out of which 1% had children under the age of 18 living with them, 63.7% were married couples living together, 7.5% had a female householder with no husband present, and 26.7% were non-families. 22.6% of all households were made up of individuals and 8.8% had someone living alone who was 65 years of age or older. The average household size was 2.57 and the average family size was 3.06. In the town, the population was spread out with 26.8% under the age of 18, 4.1% from 18 to 24, 29.0% from 25 to 44, 27.4% from 45 to 64, and 12.7% who were 65 years of age or older. The median age was 40 years. For every 100 females, there were 90.1 males. For every 100 females age 18 and over, there were 86.5 males. The median income for a household in the town was $80,660, and the median income for a family was $94,978. Males had a median income of $68,083 versus $43,810 for females. The per capita income for the town was $40,820. About 1.5% of families and 2.1% of the population were below the poverty line, including 1.8% of those under age 18 and 4.6% of those age 65 or over. Randy Edsall, head coach of the University of Connecticut football team. The major highway in Glastonbury is Connecticut Route 2, serving the town with six exits. Connecticut Route 3 only has the Main Street exit in Glastonbury. The expressway then follows its westward route across the Putnam Bridge into Wethersfield before connecting with Interstate 91. Route 17 has two exits in Glastonbury: the New London Turnpike and Hubbard Street. It then reduces to a surface street, merging with Main Street in South Glastonbury. The 95 (formerly O) route of Connecticut Transit (CT Transit) buses runs between downtown Hartford and Glastonbury, usually terminating at the corner of Main Street and Hebron Avenue. The 91 (formerly X) route travels between Wethersfield and the Buckland Hills area in Manchester via the Somerset Square Shopping Center. The 904-Glastonbury Express route conveniently operates into Putnam Bridge, St. Paul's, and St. Augustine's Park & Ride lots. The Rocky Hill–Glastonbury ferry operates between May 1 and October 31. It is the oldest continually operating ferry in the United States, dating back to 1655. Fees are $3 for a vehicle and $1 for pedestrians and bicyclists. The trip across the Connecticut River takes approximately 4 minutes. There are five elementary schools in Glastonbury: Buttonball Lane School, Hebron Avenue School, Hopewell School, Naubuc School, and Nayaug School. Eastbury school closed in 2018. Each school has between 288 and 608 students. There are two middle schools in Glastonbury. Gideon Welles School has just over 500 students for the 6th grade, and Smith Middle School has 1,035 7th and 8th grade students. The town's high school, Glastonbury High School, has 2,173 students, as of October 2013. The most notable town event is the CT River Valley Chamber of Commerce (formerly the Glastonbury Chamber of Commerce) Apple Harvest Festival, or 'Apple Fest.' The festival occurs annually every October during the apple harvest season. The festival is a town-wide event lasting three days that includes various rides, attractions, and booths from many of the local town businesses and politicians. Other events include the Under a Strawberry Moon Festival in June and various events held by the local Town Center Initiative. The Glastonbury Youth and Family Services' Creative Experiences puts on annual drama productions and family events. Popular sporting events include three 5K races organized by the Glastonbury River Runners, a local running club. Founded in 2008 by Rich Baber, the club now boasts 230+ members. The annual Glastonbury Art Walk, a joint project of the Town Center Initiative and Glastonbury Art Guild, showcases the works of local artists in businesses all over the town center. In 1993, to celebrate the 300th anniversary of the founding of the town, an exchange of bands was made between Glastonbury, England, and Glastonbury, Connecticut, resulting in Glastonbury's hosting the Glastonbury Brass Band for several enjoyable performances. The town has four private pool and tennis clubs; Minnechaug, Orchard Hill, Woodledge, and Pinebrook. Glastonbury also has a private country club with a golf course, Glastonbury Hills Country Club. The other golf course in town is a nine-hole course named Minnechaug Golf Course, located at the base of Minnechaug Mountain and owned by the town. Public aquatic facilities include the Grange pool, Eastbury Pond, an indoor pool at Glastonbury High School, and a pool at Addison Park. Cotton Hollow Nature Preserve is located in South Glastonbury and is open to residents for fishing and hiking. It is spread out across 80 acres and used to be home to several mills during the 18th and 19th centuries, which no longer stand, except for the ruins of the cotton mill which was built in 1814. The name of the stream of water that runs through the preserve is known as Roaring Brook. Glastonbury is also home to several parks open to residents including Addison Park, Blackledge Falls, Buckingham Park, Butler Field, Center Green, Earle Park, Cotton Hollow Preserve, Eastbury Pond, Ferry Landing, Grange Pool, Great Pond Reserve, Hubbard Green, Riverfront Park, Salmon Brook Park, Shoddy Mill Preserve, and J.B. Williams Park, along with several others. Glastonbury is home to several plazas which include shops and restaurants. Some include Eric Town Square, The Griswold Shopping Center, and Somerset Square. Residents are also known to enjoy the orchards of South Glastonbury, most of which are located along the Matson Hill road and Woodland Street area of town. Here, guests can buy and pick their own freshly and locally grown produce and fruits, such as blueberries and pumpkins. In the winter months, some locations sell Christmas trees. ^ a b "Geographic Identifiers: 2010 Demographic Profile Data (G001): Glastonbury town, Hartford County, Connecticut". U.S. Census Bureau, American Factfinder. Retrieved November 26, 2012. ^ a b "Early Glastonbury Industry: The Father of the Modern Poultry Industry". The Historical Society of Glastonbury. 2006. Archived from the original on 1 January 2014. Retrieved 31 December 2013. ^ Johnson Maria (Sep 14, 1982). "Arbor Acres Farms Counts Chicks Before They Hatch". The Hour - Norwalk CT. Retrieved 31 December 2013. ^ "Climate Statistics for Glastonbury, CT". Retrieved November 30, 2013. ^ Arthur Browne, One Righteous Man: Samuel Battle and the Shattering of the Color Line in New York, Beacon Press, 2015. ^ O'Connor, Anahad (December 21, 2003). "Henry Saglio, 92, 'Father' of Poultry Industry". New York Times. Retrieved 31 December 2013. ^ Wiehoff, Dale (March 26, 2013). "How the Chicken of Tomorrow became the Chicken of the World". Institute for Agriculture and Trade Policy. Retrieved 31 December 2013. ^ "Glastonbury, CT : Town Facilities". www.glasct.org. Retrieved 2016-06-28. Wikimedia Commons has media related to Glastonbury, Connecticut.